Support. Preferential lanes are established for one or more of a wide variety of special uses, including, but not limited to, high-occupancy vehicle (HOV) lanes, ETC lanes, high-occupancy toll (HOT) lanes, bicycle lanes, bus only lanes, taxi only lanes, and light rail transit only lanes. Standard. When a lane is assigned full or part time to a particular class or classes of vehicles, the preferential lane word and symbol markings described in this article and the preferential lane longitudinal markings described in EPG 620.4.2 shall be used. All longitudinal pavement markings, as well as word and symbol pavement markings, associated with a preferential lane shall end where the Preferential Lane Ends (R3-12a or R3-12c) sign (see MUTCD Section 2G.07) designating the downstream end of the preferential only lane restriction is installed. Static or changeable message regulatory signs (see MUTCD Sections 2G.03 to 2G.07) shall be used with preferential lane word or symbol markings. All preferential lane word and symbol markings shall be white and shall be positioned laterally in the center of the preferential lane. A. HOV lane—the preferential lane-use marking for high-occupancy vehicle lanes shall consist of white lines formed in a diamond shape symbol or the word message HOV. The diamond shall be at least 2.5 ft. wide and 12 ft long. The lines shall be at least 6 in. wide. B. HOT lane or ETC Account-Only lane—except as provided in the following option, the preferential lane-use marking for a HOT lane or an ETC Account-Only lane shall consist of a word marking using the name of the ETC payment system required for use of the lane, such as E-Z PASS ONLY. C. Bicycle lane—the preferential lane-use marking for a bicycle lane shall consist of a bicycle symbol or the word marking BIKE LANE (see MUTCD Chapter 9C and MUTCD Figures 9C-1 and 9C-3 through 9C-6). D. Bus only lane—the preferential lane-use marking for a bus only lane shall consist of the word marking BUS ONLY. E. Taxi only lane—the preferential lane-use marking for a taxi only lane shall consist of the word marking TAXI ONLY. F. Light rail transit lane—the preferential lane-use marking for a light rail transit lane shall consist of the word marking LRT ONLY. G. Other type of preferential lane—the preferential lane-use markings shall consist of a word marking appropriate to the restriction. If two or more preferential lane uses are permitted in a single lane, the symbol or word marking for each preferential lane use shall be installed. Option. Preferential lane-use symbol or word markings may be omitted at toll plazas where physical conditions preclude the use of the markings. Guidance. The spacing of the markings should be based on engineering judgment that considers the prevailing speed, block lengths, distance from intersections, and other factors that affect clear communication to the road user. Support. Markings spaced as close as 80 ft. apart might be appropriate on city streets, while markings spaced as far as 1,000 ft. apart might be appropriate for freeways. Guidance. In addition to a regular spacing interval, the preferential lane marking should be placed at strategic locations such as major decision points, direct exit ramp departures from the preferential lane, and along access openings to and from adjacent general-purpose lanes. At decision points, the preferential lane marking should be placed on all applicable lanes and should be visible to approaching traffic for all available departures. At direct exits from preferential lanes where extra emphasis is needed, the use of word markings (such as "EXIT" or "EXIT ONLY") in the deceleration lane for the direct exit and/or on the direct exit ramp itself just beyond the exit gore should be considered. Option. A numeral indicating the vehicle occupancy requirements established for a high-occupancy vehicle lane may be included in sequence after the diamond symbol or HOV word message. Guidance. Engineering judgment should determine the need for supplemental devices such as tubular markers, traffic cones, or other channelizing devices (see EPG 620.7 Channelizing Devices Used for Emphasis or Pavement Marking Patterns or EPG 620.8 Islands). Support. Preferential lanes can take many forms depending on the level of usage and the design of the facility. They might be barrier-separated or buffer-separated from the adjacent general-purpose lanes, or they might be contiguous with the adjacent general-purpose lanes. Barrier-separated preferential lanes might be operated in a constant direction or be operated as reversible lanes. Some reversible preferential lanes on a divided highway might be operated counter-flow to the direction of traffic on the immediately adjacent general-purpose lanes. See MUTCD Section 1A.13 for definitions of terms. Preferential lanes might be operated full-time (24 hours per day on all days), for extended periods of the day, part-time (restricted usage during specific hours on specified days), or on a variable basis (such as a strategy for a managed lane). A. Barrier-separated, non-reversible preferential lane—the longitudinal pavement markings for preferential lanes that are physically separated from the other travel lanes by a barrier, or median shall consist of a normal solid single yellow line at the left-hand edge of the travel lane(s), and a normal solid single white line at the right-hand edge of the travel lane(s) (see "A" in Fig. 620.4.2.1). 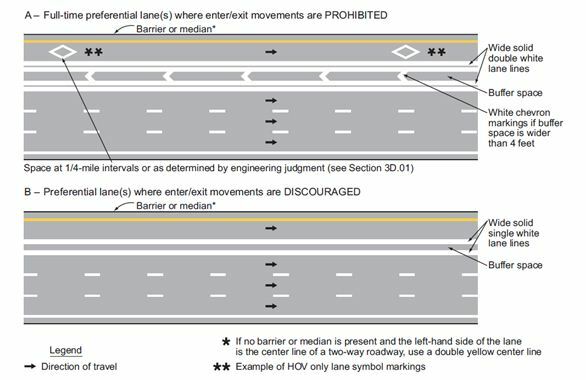 B. Barrier-separated, reversible preferential lane—the longitudinal pavement markings for reversible preferential lanes that are physically separated from the other travel lanes by a barrier, or median shall consist of a normal solid single white line at both edges of the travel lane(s) (see "B" in Fig. 620.4.2.1). 1. A wide solid double white line along both edges of the buffer space where crossing the buffer space is prohibited (see "A" in Fig. 620.4.2.2). 2. A wide solid single white line along both edges of the buffer space where crossing the buffer space is discouraged (see "B" in Fig. 620.4.2.2). 3. A wide broken single white line along both edges of the buffer space, or a wide broken single white lane line within the allocated buffer space (resulting in wider lanes), where crossing the buffer space is permitted (see "C" in Fig. 620.4.2.3). 1. A wide solid double white line along both edges of the buffer space where crossing the buffer space is prohibited. 2. A wide solid single white line along both edges of the buffer space where crossing of the buffer space is discouraged. 3. A wide broken single white line along both edges of the buffer space, or a wide broken single white line within the allocated buffer space (resulting in wider lanes), where crossing the buffer space is permitted. 4. A wide dotted single white lane line within the allocated buffer space (resulting in wider lanes) where crossing the buffer space is permitted for any vehicle to perform a right-turn maneuver. 1. A wide solid double white lane line where crossing is prohibited (see "A" in Fig. 620.4.2.4). 2. A wide solid single white lane line where crossing is discouraged (see "B" in Fig. 620.4.2.4). 3. A wide broken single white lane line where crossing is permitted (see "C" in Fig. 620.4.2.4). 1. A wide solid double white lane line where crossing is prohibited. 2. A wide solid single white lane line where crossing is discouraged. 3. A wide broken single white lane line where crossing is permitted. 4. A wide dotted single white lane line where crossing is permitted for any vehicle to perform a right-turn maneuver. Notes: 1. If there are two or more preferential lanes, the lane lines between the preferential lanes shall be normal broken white lines. 2. 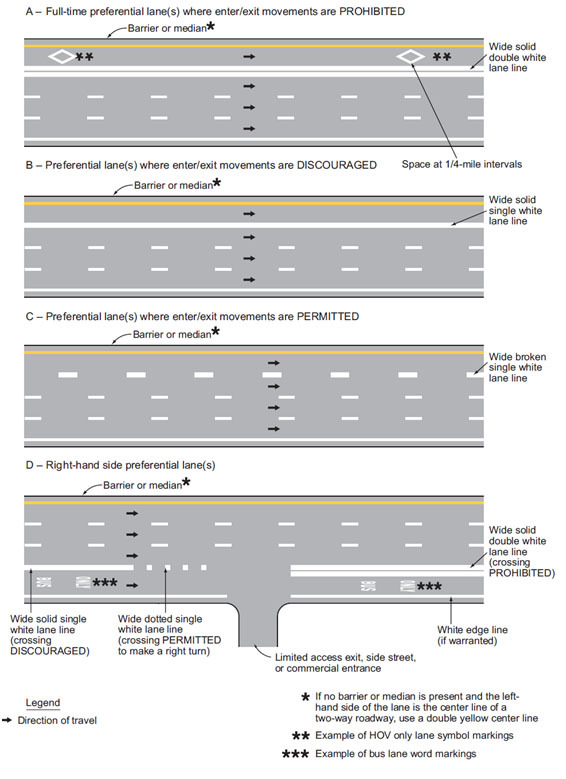 The standard lane line markings listed in this table are provided in tabular format for reference. 3. This information is also provided in EPG 620.4.2, Standard (above). Guidance. 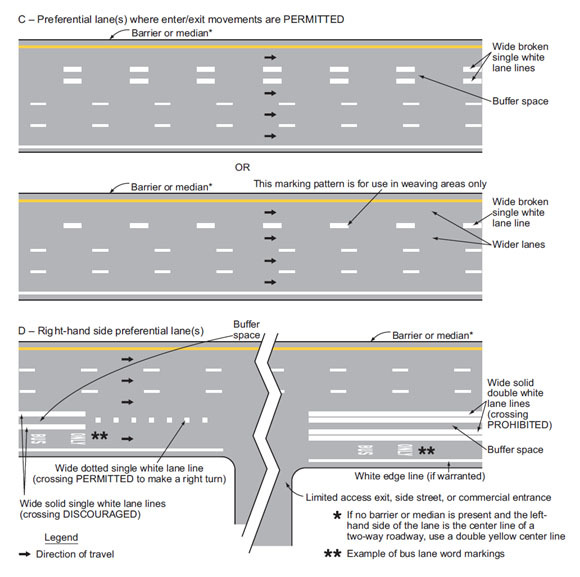 Where preferential lanes and other travel lanes are separated by a buffer space wider than 4 feet and crossing the buffer space is prohibited, chevron markings (see EPG 620.2.24) should be placed in the buffer area (see "A" in Fig. 620.4.2.2). The chevron spacing should be 100 ft. or greater. Option. If a full-time or part-time contiguous preferential lanes is separated from the other travel lanes by a wide broken single white line (see "C" in Fig. 620.4.2.4), the spacing or skip pattern of the line may be reduced. and the width of the line may be increased. Standard. If there are two or more preferential lanes for traffic moving in the same direction, the lane lines between the preferential lanes shall be normal broken white lines. Preferential lanes for motor vehicles shall also be marked with the appropriate word or symbol pavement markings in accordance with EPG 620.4.1 and shall have appropriate regulatory signs in accordance with MUTCD Sections 2G.03 through 2G.07. Guidance. At direct exits from a preferential lane, dotted white line markings should be used to separate the tapered or parallel deceleration lane for the direct exit (including the taper) from the adjacent continuing preferential through lane, to reduce the chance of unintended exit maneuvers. Standard. On a divided highway, a part-time counter-flow preferential lane that is contiguous to the travel lanes in the opposing direction shall be separated from the opposing direction lanes by the standard reversible lane longitudinal marking, a normal width broken double yellow line (see EPG 620.2.3 and "A" of Fig. 620.4.2.5). 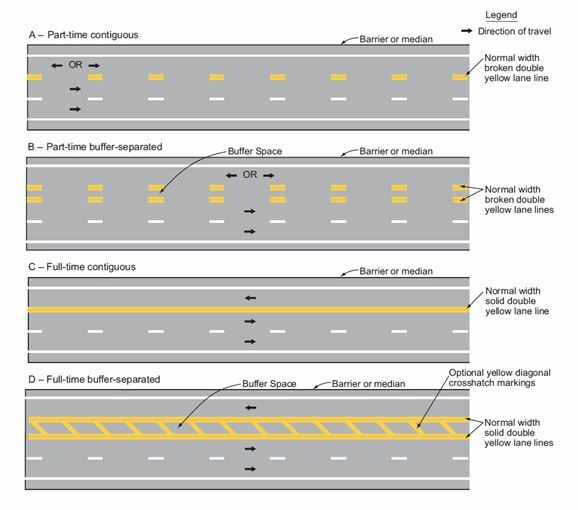 If a buffer space is provided between the part-time counter-flow preferential lane and the opposing direction lanes, a normal width broken double yellow line shall be placed along both edges of the buffer space (see "B" of Fig. 620.4.2.5). Signs (see MUTCD Section 2B.26), lane-use control signals (see MUTCD Chapter 4M), or both shall be used to supplement the reversible lane markings. On a divided highway, a full-time counter-flow preferential lane that is contiguous to the travel lanes in the opposing direction shall be separated from the opposing direction lanes by a solid double yellow center line marking (see "C" of Fig. 620.4.2.5). If a buffer space is provided between the full-time counter-flow preferential lane and the opposing direction lanes, a normal width solid double yellow line shall be placed along both edges of the buffer space (see "D" of Fig. 620.4.2.5). Option. Cones, tubular markers, or other channelizing devices (see EPG 620.7) may also be used to separate the opposing lanes when a counter-flow preferential lane operation is in effect. This page was last modified on 18 January 2012, at 15:22.